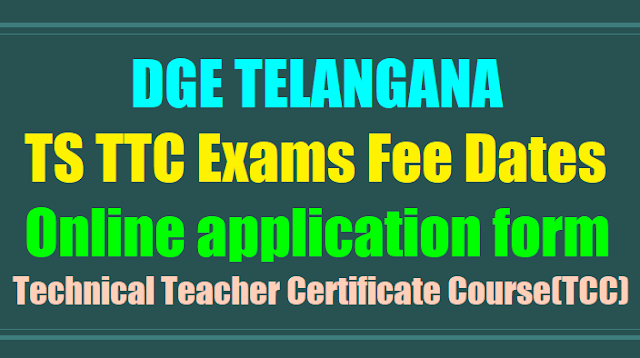 TS Technical Teacher Certificate Course(TCC)/TTC Exams Fee due dates, Online application form 2018: Technical Certificate Course(TCC) Exams Fee due dates, Online application form 2019,TTC Exam fee dates, TTC Exam Fee Online Application form, TS TTC/Technical Teacher's Certificate Course Exam fee details, Drawing TTC Exam fee Notfication Tailoring Exam fee Notification, Drawing Tailoring Exam fee Notification,TTC Trades/TCC Trades Exam fee notification, Drawing Lower, Drawing Higher, Tailoring Lower, Tailoring Higher Course Exam fee notification. TCC (Lower & Higher) Exams 2018 fee dates. Technical Certificate Course Exams, January, 2019: Introduction of ONLINE system in receiving of candidates Application forms along with Nominal Rolls - Certain Instructions: DGE has informed that after having examined the problems that are arising in submission of application forms through relating to the TCC (Lower & Higher) Examinations, from 2018 year ONLINE system for receiving the application forms of the candidates is introduced while dispensing of ICR Application forms in Technical Certificate Course (TCC) Examinations, January-2018. The following instructions shall be adhered to while receiving the ONLINE applications uploaded by the candidates and preparation of Nominal Rolls. The last date for submission of uploaded application forms by the candidates. → డ్రాయింగ్‌, టేలరింగ్‌, ఎంబ్రాయిడరీ లోయర్‌, హయ్యర్‌ టెక్నికల్‌ సర్టిఫికెట్ కోర్సు పరీక్షలకు హాజరయ్యే విద్యార్థులు న‌వంబ‌రు 27వ తేదీలో పరీక్ష ఫీజు చెల్లించాలి. → లోయర్‌ పాసయిన వారు హయ్యర్‌ పరీక్షలు రాసేందుకు అర్హులు. → పరీక్ష రాయలనుకునేవారు దరఖాస్తును పూరించి, చలానా కట్టి తమ కార్యాలయంలో అందజేయాలి. → టేలరింగ్‌, ఎంబ్రాయిడరీ లోయరు గ్రేడుకు రూ.150, హయర్‌ గ్రేడుకు రూ.200 పరీక్ష ఫీజుగా చెల్లించాలి. 3. The received Online application forms along with Nominal Rolls are to be submitted in this Office. "The last date for submission of uploaded application forms by the candidates is 27-11-2018....."
4. Trade code: Connected trade code to be selected. Trade Trade code Fee Rs. Trade Trade code Fee Rs. 5. The minimum Educational qualification for Lower grade is VII class for all Trades (attested copy should be enclosed ). 7. Aadhar Number should be filled. 8. Candidate postal address to be filled. 9. The following District Code & District Name to be selected in respective box. 10. Challan particulars to be filled by the candidate. 11. His / Her recent pass port size photograph and signature shall be scanned and uploaded at the relevant boxes. DD's towards payment of exam fee will not be accepted. Such applications will summarily be rejected. It is hereby notified that the Technical Certificate Course Examination in Lower and Higher Grades in Drawing and Tailoring & Embroidery will be held in the month of January, 2019 at the identified centres in all the (31) Districts of Telangana State. The candidates who have passed VII Class Examination are eligible to appear for Lower Grade Examination -in the above Trades and those who have passed Lower Grade Technical Examination (or) equivalent to lower grade exam are eligible to appear Higher Grade Examination in the concerned Trade. The candidates desiring to appear for these examinations should apply through ONLINE in our website i.e., www.bse.telangana.gov.in and submit their down loaded web application forms at concerned District Educational Officer. The candidates who possess Pass Certificates issued by the States / Boards other than Telangana either Academic or Technical qualifications shall obtain prior permission from the Director of Government Examinations, Telangana, Hyderabad for admission to above Technical Examinations. 3. Incorrect, incomplete and defective application forms will summarily be rejected without any intimation and the fee will neither be refunded nor reserved for any subsequent examination. 4. Any change of address should be communicated immediately to the Additional Joint Secretary to the Director for Government Examinations, T.S., Hyderabad concerned. 5. Uploaded Application form and its enclosures along with challan of Drawing and Tailoring & Embroidery Lower and Higher Exams should be submitted to the District Educational Officers concerned only. 6. The applications received without necessary enclosures or after the due date notified will summarily be rejected. 7. Candidates coming up from outside the State should obtain prior permission of Director of Government Exams, Telangana State, Hyderabad for appearing Technical Certificate Course Exams before paying the examination fee. 8. Intimation to the candidates consisting of date of examination, venue of the centre, Roll. No. etc., will be hosted on the website www.bse.telangana.gov.in 4 to 5 days earlier from the commencement of Examination. how to pay the examiniation fee....?? ?